Lanthanotus borneensis is an enigmatic lizard known only from Sarawak, on the island of Borneo, in insular southeast Asia. Lanthanotus is fossorial, nocturnal, and semiaquatic, thus it is rarely observed and little is known of its life habits. Although it is called the earless "monitor", Lanthanotus is actually the sole living representative of Lanthanotidae, a clade closely related to, but different from, monitor lizards (see Varanus gouldii). Lanthanotus holds a key position in the phylogeny of anguimorph lizards, the majority of which are extinct and thus known only from skeletons. But Lanthanotus itself is very rare in collections, and because specimens are next to impossible to replace (Lanthanotus is completely protected in Sarawak), curators are extremely reluctant to permit destructive preparation. 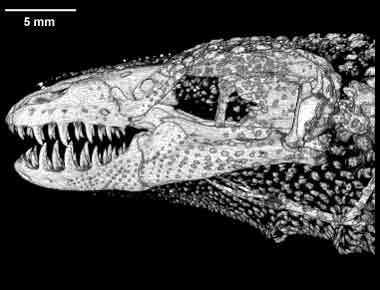 For these reasons, Lanthanotus is a "holy grail" in herpetology, and provides a perfect example of the advantage of high-resolution X-ray CT for studying osteology in precious specimens. Although Lanthanotus superficially resembles monitor lizards, it is easily distinguished from them by its lack of a gular fold and external ear, its transparent lower eyelid, and its blunt nose and bulbous temporal regions. Osteological features that set Lanthanotus apart include broad palatal shelves, contact of the prefrontal and the postfrontal above the orbits, a vertical suture between the angular and splenial on the medial side of the jaw, and the presence of palatine teeth. Most of these features can be seen in the three-dimensional reconstructions shown on this page, which can be directly compared to those of Varanus gouldii. This scan revealed two features previously unknown in Lanthanotus. The first is the full extent of osteoderms (bones embedded in the skin) around the skull. In McDowell and Bogert's (1954) landmark study, an X-radiograph of Lanthanotus revealed only the most robust osteoderms on the dorsal aspect of the head. 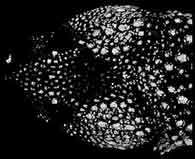 But as shown in the "skeleton only" animations above, Lanthanotus possesses a much more extensive array of osteoderms than could be detected by conventional X-radiography. Three-dimensional renderings isolating the osteoderms and the skull can be found in "additional imagery". The second feature newly revealed by this scan is that Lanthanotus possesses a palpebral bone, a bone in the anterodorsal corner of the orbit (see below). This bone was overlooked previously because it is very reduced and isolated in soft tissue in this taxon -- thus, when specimens were skeletonized, the palpebral was lost. Both the osteoderms and palpebral in Lanthanotus are fully described in a recently published paper (Maisano et al., 2002). 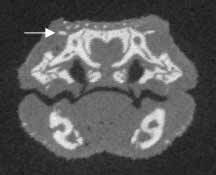 Coronal slice through orbits showing position of palpebral deep to osteoderms. This pickled specimen, collected in the 1960s, was made available to The University of Texas High-Resolution X-ray CT Facility for scanning by Dr. Jacques Gauthier of Yale University. Funding for scanning was provided by a National Science Foundation Digital Libraries Initiative grant to Dr. Timothy Rowe of The University of Texas. The specimen was scanned by Matthew Colbert and Richard Ketcham on 17 December 1999 along an oblique axis for a total of 204 slices, each slice 0.09 mm thick, with an interslice spacing of 0.09 mm. Estes, R., K. de Queiroz, and J. Gauthier. 1988. Phylogenetic relationships within Squamata, pp. 119-281. In R. Estes, and G. Pregill (eds. ), Phylogenetic Relationships of the Lizard Families. Stanford University Press, Stanford, California. Harrisson, B. 1962. Beobachtungen am lebenden Taubwaran Lanthanotus borneensis. Natur und Mus. 92:38-45. [English translation by P. Gritis, 1989, Bulletin of the Chicago Herpetological Society 24:185-188]. Maisano, J. A., Bell, C. J., Gauthier, J. A., and T. Rowe. 2002. The osteoderms and palpebral in Lanthanotus borneensis (Squamata: Anguimorpha). Journal of Herpetology 36:678-682. McDowell, S. B., and C. M. Bogert. 1954. The systematic position of Lanthanotus and the affinities of the anguinomorphan lizards. Bulletin of the American Museum of Natural History 105:1-142. Three-dimensional volumetric renderings isolating the osteoderms and the skull. All are 1mb. To cite this page: Dr. Jessie Maisano, 2001, "Lanthanotus borneensis" (On-line), Digital Morphology. Accessed April 19, 2019 at http://digimorph.org/specimens/Lanthanotus_borneensis/.